Unkaizan is an authentic Japanese restaurant in the island, popular with both tourists and locals. The restaurant is located in Pantai Tengah but a bit away from the main locallity. As you go towards the southern end of Pantai Tengah, a steep but short uphill lane one the left leads to the restaurant. Unkaizan is marked by a small decorated bullock cart at its entrance. When you see that, you know that you have reached the door step of Unkaizan. The bullock cart is actually created by its own chef Katsuji Takabayashi who has extensive experience in five star hotels making exclusive Japanese dishes like Suhshi, Sashimi etc and also charcoal grills, noodles and many different kinds of mouth watering desserts. She prepares all the dishes here herself. 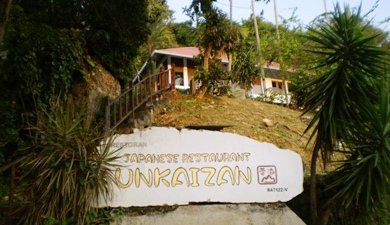 The Malaysian Tatler magazine has voted Unkaizan as the best restaurant in Malaysia for six years in a row starting 2005. 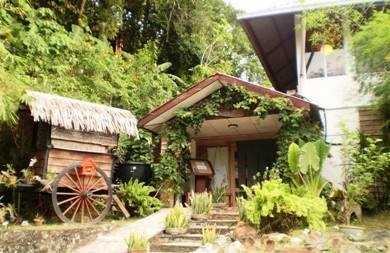 The restaurant is nestled in a forested area on a hill and overlooking the Andaman sea. It's a beautiful serene surrounding. The upper floor has typical Zen type of Japanese traditional seating arrangement. In the lower floor there is standard air-conditioned indoor seating as well as open air seating in the garden terrace amongst lush greenery. View of the sunset on Andaman sea from its terrace garden or upstairs seating is awesome. One of the key features of the restaurant is its in-house aquarium of live fish and seafood. You will find tiger prawns, lobsters, snappers, garoupa and many other types of fish. They are not only fresh and live, you can also choose the one you like to be cooked and served. And there are different cooking styles that you can choose from like sashimi, shioyaki, teppanyaki, teriyaki, karaage etc. The staff will explain which styles are good for a type of fish or seafood. Well, there are several ways you can go about dining here. Either look for the black board where the day's specials from the chef are handwritten. Depending on the season, you will find dishes like live lobsters - you can get it grilled or sashimi. Sometimes you may also get Lobster kamameshi where rice is cooked with lobsters in traditional rice pot. Other special dishes include the live white fish like snappers or sea bass where you can choose the cooking style such as sashimi, grill, deep-fry, teppanyaki etc. Another way to dine at Unkaizan is to go for the set menu. Here you will get choices of sirloin steak, tenderloin steak, white fish fillet, rib eye streak, assorted seafood etc and all are served with fried rice, soup and fruits. Another great option is Sushi Gozen comprising of Appetizer, assorted sushi, tempura, egg custard, soup and fruits. Apart from the above, there are a range of sushi and sashimi including rolled sushi items. You can choose from tuna, salmon, tiger prawn, scallop, octopus etc. But one of our personal favorites here is a charcoal grilled item like prawns, seafood, chicken and even black cods that are served on a small charcoal grill right on your table. While it gives the fresh charcoal flavor, you also get the fun of stirring and grilling it further to your taste. You can also alternatively take steaks served on a hot plate. They keep a nice selection of fine wine in their cellar. In desserts, you can choose from handmade ice creams, deep fried ice creams, rice cake with mitarashi sauce, rice cakes with red beans etc. But remember, Japanese food is about quality and not quantity. So if you are looking for hearty portions, you may be a bit disappointed. Also the cost here is quite high. Overall the service is quite good and friendly. The staffs are helpful to explain you about the food and the different cooking styles that you may choose from. Open daily 6pm to 11pm except for the 2nd Wednesday of a month. They accept credit cards. As you go towards Awana Porto Malai Resort (now known as Resorts World Langkawi) at the southern end of Pantai Tengah, opposite to the Lanai Resort you will find a lane going uphill. A short climb will reach you to the restaurant. In fact you will see the signs below at the main road.